DSOGaming writes: "It’s ironic as earlier today we said that we wouldn’t post more mods about Skyrim – in daily basis – but here is what most PC gamers have been waiting for. Yeap, that’s a proper PC UI. 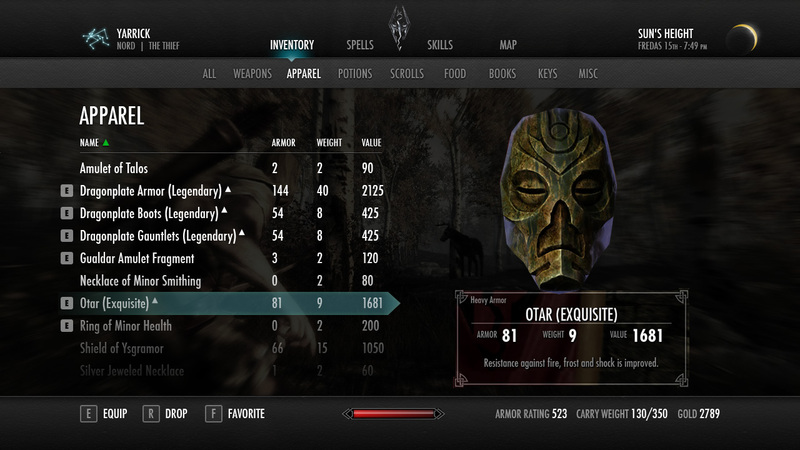 Modder Roltak released yesterday his QD Inventory, an interface mod that displays the inventory in a table instead of the usual style, thus improving its usability. This is clearly a must-have mod for every PC gamer that wants to enjoy Skyrim." I'm amazed Bethesda couldn't come up with something so practical as this, someone there needs to be fired. Good decisoin i havent played it yet. Ill play the game once mods are done doing the devs finishing work and i dont have to pay consolish price of 60usd. Really, something is wrong when the costumer fixes your product for a multi-millionaire studio like the folks at Bethesda. Iroquis, it's not uncommon at all. The developer has a certain amount of time to make the game and a certain amount of time to test the game. Bethesda's games are usually large in scope so it should be understandable why they would make mistakes that seem foolish in hindsight. They gave the PC community the modding tools because they knew that the community would play the game for several more hours than Bethesda would have to test it, and the PC community would be able to figure out what needs to be changed or improved. And all of this complaining continues to happen despite all the successful mods that have been released to the public within the last 9 days. I guess it's mostly the console gamers who can't benefit from the modding community. I have Skyrim on PC, but I use a controller, so I find the current interface to work quite well. It's even better when I clear my inventory of unnecessary items. No matter what is made, there is always room for improvement. So I wouldn't say Bethesda didn't do a proper job, it's a huge improvement over oblivions ui anyway. I wouldn't call it a huge improvement. It's a bit cleaner, that's for sure, but it's basically the same thing split into two menus instead of one, with the "paper doll" aspect removed--something that I, for one, really liked. Unfortunately there wont be much games on console which do allow mods. Infact i am sure there are hardly 1% games on consoles that support mods, the only i can think of is UT3 out of 500 or so games released on the PS3. Hence the percentage would be .2% or so. The reason why console companies dont allow mods is because mods give the user to create their own content which compromises DLC sales. Hence being companies they dont want to lose out on the chance to make that money, how else would they sell silly DLCs such as armor, new weapons etc or even maps. Its pratical but it looks hella messy and untidy :) thats the reason :) all about simplicity and design with the Gui,. I really like that one, it would work great for gamepads too. The one they have isnt real great for anything. oh when do we get that one, like that alot. Whats the name of this upcoming mod and where did you find the screenshot? I didnt mind the one they had, but this looks better. I find the original ui really annoying with a gamepad compared to oblivion, and simply just manageable on pc. I don't like the font, the current visual design is much better in that sense. Looks more practical to use, on the other hand. I'm looking forward to the one Apotheosize posted more, personally. tried it and not bad but when I'm trading equipment with my follower there is no MISC. column for my character, I can use ALL but its annoying when you want to pass off some dragon bones and scales. If you want a proper UI for PC, use a 360 controller. Sad but true. I disagree, the ui is more manageable with keyboard and mouse but more geared at looking nice then being efficient. That font is headache worthy, no thanks I'll wait for the other one to finish being developed. Chest sorting is nice though, good lord why wasn't this in the vanilla game. Honestly, as a console gamer, I wish that the 360 version had a table like this, or the ability to sort by various characteristics. Especially when I'm trying to pick stuff out of my home chest, not being able to sort by potion or by value makes for a very time-consuming endeavor. Congrats on the cool mod, PC-gamers. Getting this mod asap. The current UI is nothing short of terrible, really what were they thinking. On a general note enjoying the game although not sure its better than the Witcher 2, I'll reserve judgement until the end though. It isn't as bad as Morrowind or Oblivion's I don't really care about the current UI, anything is better than Morrowind and Oblivion's were. Even Fallout's pip-boy was crap on PC. This one you can use the WASD keys to scroll through while getting your mouse to where you want it. I'll tell you one thing though; the damn scroll, highlight, and click for conversations and favorites is annoying and doesn't work.